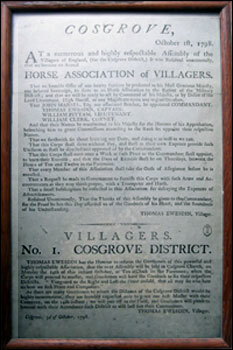 That an humble Offer of our hearty Services be presented to his Most Gracious Majesty, our beloved Sovereign, to serve as an Horse Association to the extent of the Military District; and that we will be ready to act by Command of his Majesty or by Desire of the Lord Lieutenant, High Sheriff, or any Magistrate upon any urgent Occasion. That JOHN MANSEL, Esq. our associated Brother, be appointed COMMANDANT. And that their Names be transmitted to his Majesty for the Honour of his Approbation, beseeching him to grant Commissions according to the Rank set opposite their respective Names. That we forthwith set about learning our Duty and doing it as well as we can. That this Corps shall serve without Pay, and shall at their own Expence provide such Uniform as shall be directed and approved of by the Commandant. That this Corps shall meet once a Week at such Place as the Commandant shall appoint, to learn their Exercise; and that the days of Exercise shall be on Thursdays, between the Hours of Ten and Twelve in the Forenoon. That every Member of this Association shall take the Oath of Allegiance before he is enrolled. That a Request be made to Government to furnish this Corps with such Arms and Accoutrements that they may think proper, with a Trumpeter and Horse. That a small Subscription be collected in this Association for defraying the Expences of Advertisements. Resolved Unanimously that the Thanks of this Assembly be given to the Commandant, for the Proof that he has this Day afforded us of the Goodness of his Heart, and the Soundness of his Understanding.